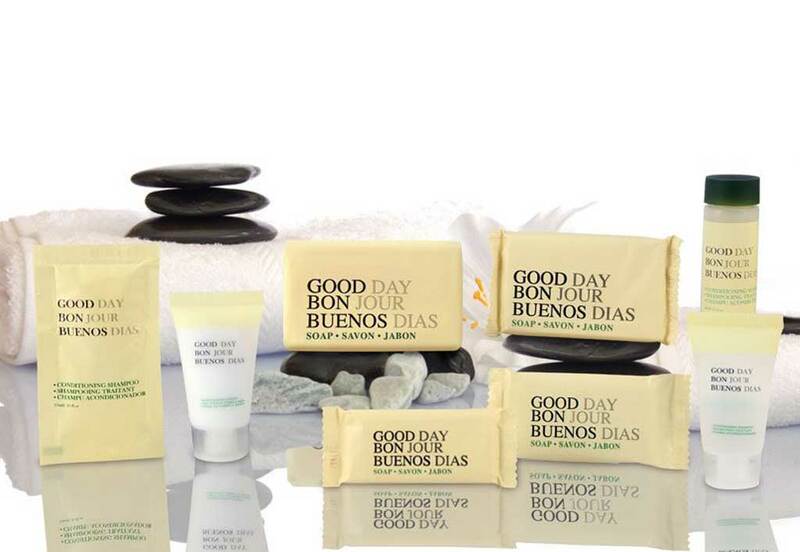 Transmacro Amenities’ Good Day soap and amenities collection is becoming one of our fastest growing amenity collections. This great value displays its Good Day name in English, Spanish, and French. That makes this amenity collection highly desirable for areas that regularly hosts international visitors. Matching liquid amenities complete this attractive soap and amenities collection offer. Please inquire for details on how you can order Good Day through our redistribution partners or from Transmacro Amenities (quantity requirements apply). Your international customers will appreciate this unique collection. After a day of exploring, a nice shower using our Good Day Bar Soap will revive and refresh. Leaving the customer with an exhilarated sense of being. This soap is a mild and gentle way to rinse off the day and step out for the evening! Your customers will be coming back for more. Good Day shampoo and conditioner will leave customers feeling fresh and clean! Made with natural ingredients, this gentle formula, with a highly intoxicating fragrance, will keep your customers happy and having a Good Day. Moisturizing lotions are an important part of the amenity collection. Keeping your skin soft, fresh and moisturized, are key in maintaining health. Transmacro Amenities’ Good Day moisturizing lotion will help maintain beautiful skin.